Paw Print Genetics - How prevalent is Neuronal Ceroid Lipofuscinosis in the dog? Unfortunately, details about disease incidence and prevalence within a breed are often difficult to obtain including NCL. Without going into an in-depth discussion about statistics, among other conditions, in order to estimate incidence and prevalence of disease for an entire population, individuals included in a study must be chosen at random and the number of individuals must be large enough to provide confidence that they represent the population as a whole. Decisions about sample collection for canine genetic studies often occur for practical reasons with cost and time being two important determining factors. Financial resources available for studies looking at population genetics in canines are scarce in comparison to funds available for human population studies. Therefore, investigators in canine medicine will often use nonrandom sampling methods to collect their study participants as it is typically much less expensive and more time effective than random sampling. Commonly, studies involve genetic testing only on dogs showing clinical signs similar to the disease in question or only performing testing on dogs from a particular geographic area or kennel. Though these methods work fine for studying the characteristics and inheritance of disease, estimating accurate disease prevalence of the greater population is nearly impossible under these circumstances. Much of what we know about NCL in dogs is due to an attempt to understand NCL in people. As is true with many diseases of dogs, canine NCL is an important, non-human model for the human variant (sometimes referred to as Batten’s disease in people). All moral or ethical discussions aside, dogs have played an important role in development of an understanding of NCL in both species. Through the sacrifices and study of dogs stricken with this disease, advancements in human treatments have been developed that could eventually be used in dogs as well. Though we are far from finding a safe, cost effective and reliable cure for NCL of either species, understanding of neurologic diseases is advancing at a rapid rate. As a consequence of these studies, the understanding of NCL in dogs has also progressed significantly. With the development of genetic tests and the implementation of NCL testing to identify disease carriers among breeding dogs, it is likely that hundreds or thousands of potentially unfavorable mate pairings have been avoided, thus preventing the creation of affected puppies and improving overall canine health. About 20 dog breeds have been reported to develop NCL, though not all of the causal mutations have been identified. Of the breeds in which the causal NCL mutation has been identified, two American national breed clubs recommend testing to help eliminate this disease from their breed: the Border Collie Society of America and the American Staffordshire Terrier Club of America. 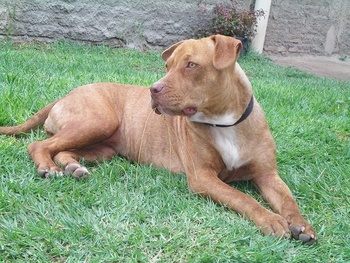 In addition, given their link to the lineage of the American Staffordshire terrier, the American pit bull terrier (as recognized by the United Kennel Club) should also be strongly considered for testing. Given the lack of an effective treatment and the inherent lethality of this disease in most cases, genetic testing of breeding stock should be an important consideration for any breeder of dog breeds known to inherit this condition. As of this writing, Paw Print Genetics currently offers testing for 8 types of NCL: NCL1 (PPT1 gene; miniature dachshund), NCL2 (TPP1 gene; miniature and standard dachshund), NCL4a (ARSG Gene; American pit bull terrier/American Staffordshire terrier), NCL5 (CLN5 gene; border collie), NCL6 (CLN6 gene; Australian shepherd, miniature Australian shepherd, miniature American shepherd), NCL8 (CLN8 gene; English setter, Irish setter), NCL10 (CTSD gene; American bulldog) and Adult-onset NCL (ATP13A2 gene; Tibetan terrier).